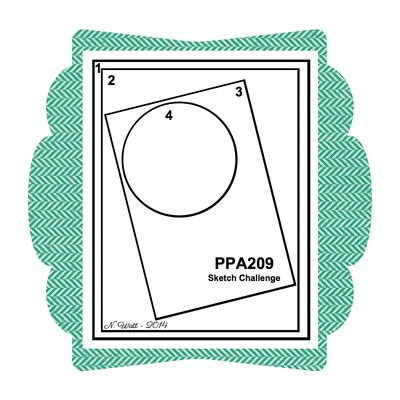 Celebrate in June with PPA209! Home Birthday Celebrate in June with PPA209! At our house, June is jam-packed with birthdays, accompanied by an occasional anniversary or graduation celebration or two….or three. Oh, and don’t forget Father’s Day is thrown in there too! As you can see, I pretty much stuck to the sketch (love it!). I usually tend to center most of the elements on my card, so it was fun to mix it up a little by making both the rectangle and circle shape a bit “off”. This card begins with a base of natural ivory cardstock, followed by a layer of Season of Style Designer Series Paper that is sponged around the edges in Old Olive ink. The rectangular tag is Sahara Sand. 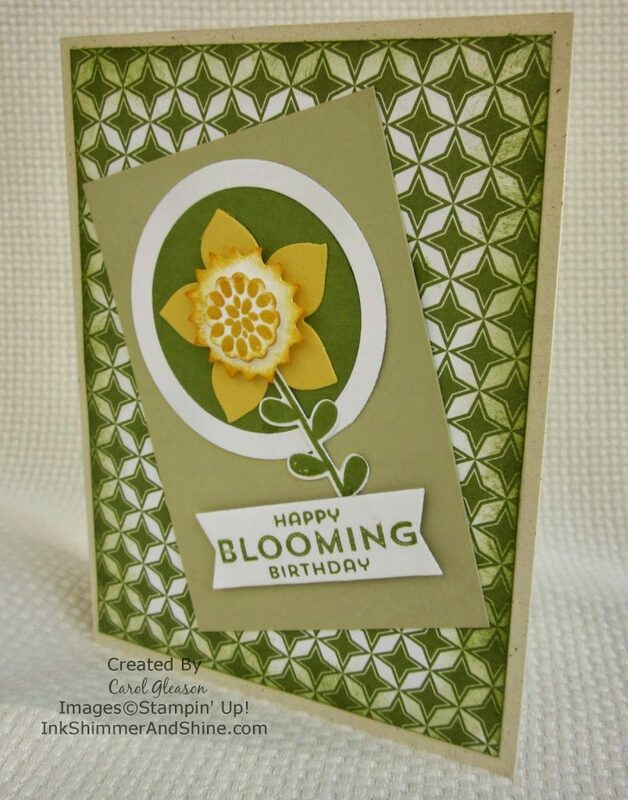 All the flower pieces and the sentiment are from the new Stampin’ Up! Flower Patch stamp set. The flowers are die cut with the Flower Fair framelits and the small ones are sponged with Crisp Cantaloupe and Crushed Curry ink, then layered with dimensionals. Having stamps and framelits made for each other is awesome! The sentiment is stamped in Old Olive ink on Whisper White cardstock and die cut using the banner from the Thinlits Circle Card framelit. Since creating the layout often consumes the most time, starting with this sketch allowed for quick assembly of the elements. Just what I needed during this busy month of celebrations! I hope you have something to celebrate this month and that Nicole’s sketch will inspire you to create a card or two. Here’s the link to the Pals Paper Arts Blog. We’ll be celebrating birthdays for my son, husband and daughter next week. So the party continues! Flower Patch, Pals Paper Arts Challenge. Bookmark. Oooooh….gorgeous flower Carol and great color combination! Thanks for playing along with us this week at Pals Paper Arts!